Following the success of last year’s Summer of Circus festival, during which Worthing staked a claim to be the home of circus on the south coast, Worthing Theatres have announced their line-up for 2017. Now recognised as one of the three largest contemporary circus festivals in the UK, the new programme promises thrills for the whole family through a range of live performances and workshops from June 16 to August 27. Head of culture, Adur and Worthing Councils, Amanda O’ Reilly, said: “We are thrilled to be launching our second Summer of Circus, three glorious months of the hottest wheeling and spinning, sweat-packed, muscle-bound athleticism you will ever have the pleasure of experiencing, amalgamating the best international circus companies right here in Worthing. “Launching the season will be one of the newest and most dynamic circus ensembles in the UK, Barely Methodical Troupe, with their latest production Kin (June 16-17). “After opening the previous Summer of Circus season, Acrojou will be returning to Worthing staging two free performances of The Wheel House at Steyne Gardens as part of the Worthing Children’s Parade (June 17) and at Broadwater Green for the Broadwater Carnival (July 22). They will also be teaching the art of the German Wheel in their workshop at the Assembly Hall (August 6). Trampoline artist Max Calaf Sevé brings his charming tale Anyday to the Pavilion Theatre (July 1), which explores the comic, surreal and absurd world Max shares with his pet bird on his trampoline as he pulls off acrobatic skills to an original score. There will also be trampoline workshops for children (June 30) and adults (July 1). “Dizzy O’ Dare displays her skills on the high-wire in the world premiere of her show Rise (July 18), fixing helium balloons to her hair as she wanders into the twilight world of showbusiness mixing song, circus and cabaret with a delightful blend of comedy and live music. There will also be a workshop on the day of the performance for people to test and improve their skills on the tightrope. “Head First Acrobats bring their internationally-acclaimed circus show Elixir (July 21) to the Pavilion Theatre, three handsome scientists attempt to create the elixir of life through acrobatics involving a teeterboard, roue cyr wheel, handbalancing and trapeze. They are also inviting people to develop their own acro-balancing skills in a workshop (July 20). “After wowing Worthing audiences in last year’s festival, Ockham’s Razor return with their new show Tipping Point (July 28-29), winner of the Total Theatre Award and Jacksons Lane Circus Award at the Edinburgh Festival 2016. 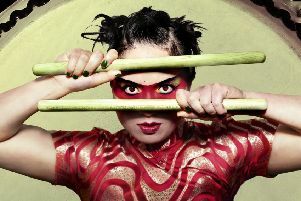 “Travelling from Amsterdam, circus company Le Cirque Du Platzak bring Kermiz to the Pavilion Theatre (August 5), a circus adventure themed around the dark side of a Grimm fairy tale, with rousing folk music throughout.